‘Fairyland’ may not exist but the idea of an idyllic place inhabited by fairies, goblins and elves certainly is one that appeals to most children and even some adults. 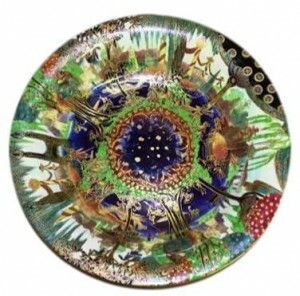 While Wedgwood Fairyland lustre ware may not be as unattainable, it is an unusual design and is sought after by collectors all over the world. 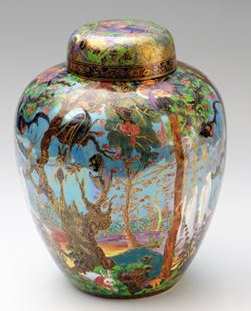 Pictured right: A Wedgwood Fairyland lustre vase – decorated with the ‘Candlemas’ pattern, of gently tapering ovoid form, richly gilt and painted in colours with vertical bands of climbing elves and panels of fairies in a fantastical landscape, printed factory mark and painted number ‘Z5157/A’, 20cm high. Manufactured by the Wedgwood factory from 1915 to 1929 after original designs by Daisy Makeig-Jones (1881-1945), the ‘Fairyland’ line proved to be popular in the United States as well as in the UK. Credited with helping improve Wedgwood’s struggling profits, Makeig-Jones’ novel designs were far more than ‘pretty patterns’. Daisy Makeig-Jones prided herself on creating stories and hidden worlds with fantastical themes, using rich jewel-like colours and imaginative details. With expressive titles such as ‘Fairy Gondola’, ‘Butterfly Women’ and ‘Leap-frogging Elves’, her work appealed to the public possibly as they offered a form of escapism during the difficult post-war years. 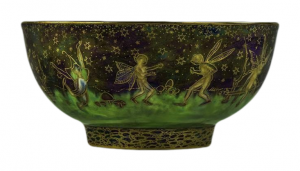 Wedgwood stopped the ‘Fairyland’ lustre ware line in 1929 due to an apparent lack of interest. Today the enthusiasm for Makeig-Jones’ work is as strong as it ever was, possibly even more so than when the designs were first introduced in the 1920s. Interest in the artist’s work has been further enhanced by various Art Deco exhibitions featuring examples of her work including one at the Victoria and Albert Museum, in September, 1990; an exhibition of ‘Wedgwood Fairyland and Other Lustres’ at the Long Beach Museum of Art, in September, 2001; and an exhibition comprising solely of her work from the Collection of Maurice Kawashima at the San Diego Museum of Art in 2005. Sold for £800 at McTears, April 2018. 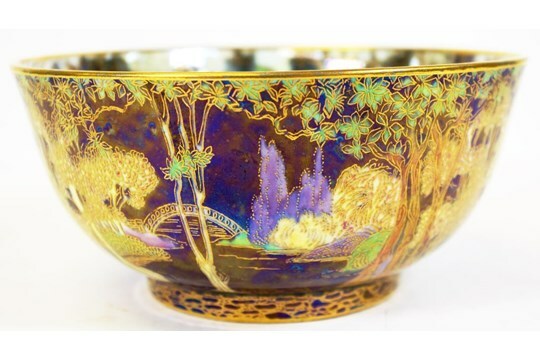 Wedgwood Fairyland Lustre Bowl Exterior Pattern Woodland Bridge. Sold for 2,600 AUD at Barsby Auctioneers, June 2018. Sold for £29,500 at Sworders, Jan 2013. 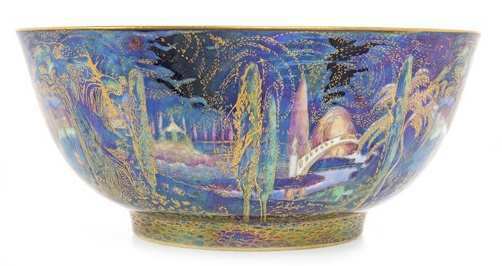 A 1920s Fairyland Lustre octagonal bowl decorated in the Geisha or Angels pattern. Sold for £1.750 at Fieldings, March 2018. NOTICE – This site is not affiliated with Wedgwood TM. The purpose of these pages is to provide information to collectors of Wedgwood.